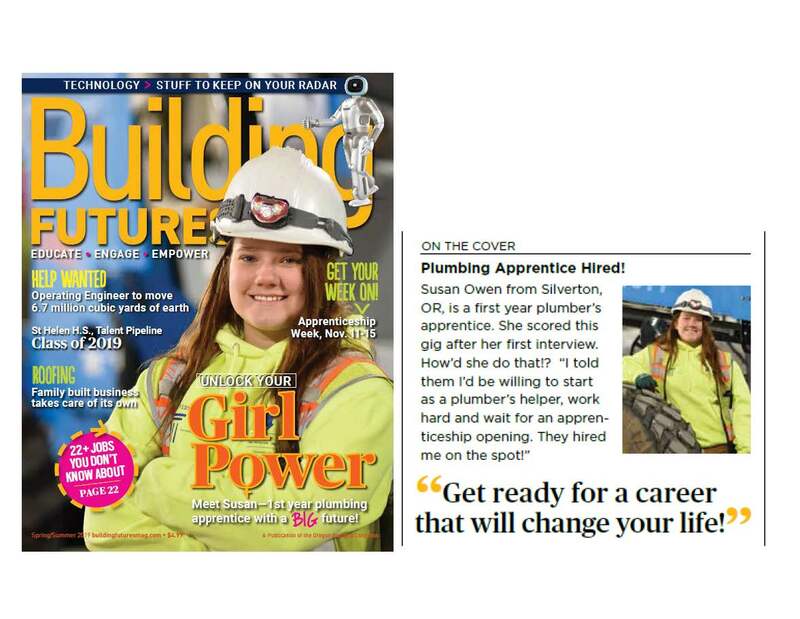 Area II Plumbers JATC Apprentice on the cover of Building Futures Magazine. Plumbing isn’t always about fixing broken toilets, pipes and leaky systems. It’s about sanitation and about taking care of the people. What many people fail to understand is that plumbing is a necessity within the world’s sanitation and health industry. Without quality plumbing, health issues would arise and diseases would take over the world once again – think the black plague. Plumbing isn’t just about fixing people’s broken sinks and toilets, or even crawling underneath their houses covering yourself in spider webs and dust, there’s a whole different side to the plumbing industry; new construction. Imagine you are building a brand new apartment complex; plumbers go into the beginning stages and install plumbing within the walls and the floors. Working in new construction is a fairly clean and dry environment. There are many different options when working as a plumber, service and new construction can be different worlds, and both very important in our society. I am 22 years old, single, and I have already purchased my own house, truck, and I can afford my hobby – racing motocross. I got involved in plumbing because my grandpa worked as a plumber for a company in Milwaukee, OR. Then my dad became a plumber here locally, I decided that I wanted to make a solid living while doing something for society. The demand for plumbers is very high, and since there aren’t many people interested, the pay is very good. Most of my friends decided to go to a four-year college to get a degree. The difference between my friends and I, is that I don’t have any student loans and was making about 18 dollars an hour by the time I was halfway through the program. Whilst working as a plumber, not only have I gained many new friends, but also I have furthered my success within my own life. I work every day, but I don’t get covered in nasty substances, I put new pipes and fixtures in the brand new building and I get to see how plumbing is installed from start to finish. There’s no greater feeling than success; the ability to have all of my own things, and be able to afford them without crippling debt. When I get home Friday night I can curl my hair put on a nice outfit and go out with the girls. My name is Kersey, and I’m a 4th year apprentice, about to turn out to take the state test to receive my journeyman’s card. As a Journeyman Plumber I can do everything my Training Agent has been teaching me to do during my Apprenticeship, and I have the opportunity to open my own plumbing business if I choose. I would personally love to see more women working in this trade, plumbing has always been considered “a man’s job” yet it’s becoming quite apparent that females make great plumbers too! It’s a great hands-on career for those who don’t want to be tied down to a desk or cubicle. Being a female plumber doesn’t mean that you can’t still be “girly”. I still wear make-up daily and feel great rockin’ my Carhartts. Plumbing also helps fund my hobbies; which include barrel racing and dirt track race cars. Without making the wages I do with this job, these hobbies wouldn’t be financially possible. After a day at work I’m able to come home and be a wife, a mother to my three wonderful kiddos, and know that my career keeps us all feed and doing the extra things we enjoy. If you love to be up and moving during the day, make excellent money, and feel empowered by your work, then plumbing is the job for you.